The full title of this book is Inspector Queen's Own Case: November Song. Technically, too late for the "Golden Age" (between WWI and WWII) but Ellery Queen's writing began in that period. Synopsis: The wealthy Humffrey family has a summer home on Nair Island, part of Taugus, CT. There are five other homes on the island, which connects to the mainland by a causeway. Alton and Sarah Humffrey are childless and aging, and arrange a shady purchase of a newborn from shyster attorney A. Burt Finner, whom they name Michael Humffrey. The child is cared for by nurse Jessie Sherwood, 49, single - having lost her fiance at Normandy. Richard Queen (Ellery's father) has just been forced into retirement, having reached the age of 63. He is somewhat despondent at that, and takes a summer vacation at the home of his friend Abe Pearl, chief of Taugus police. There is tension from Ronald Frost, Alton's nephew. Ronald runs up gambling debts to which Alton has bailed him out in the past, but no more since Michael has arrived. Ronald had planned to be Alton's only heir, but now that is no longer the case. One night, someone enters the nursery and smothers Michael with a pillow. Investigation begins by Abe Pearl, along with Richard Queen. Queen and Jessie Sherwood hit it off and a romance blossoms. While searching for a motive, attorney Finner is murdered, and his adoption records stolen. Besides the story line, there are two other big themes lurking here. First, the murder of a baby - and children in general - has long been off-limits for mystery writers - but in 1956 that was still happening, so we must overlook the revulsion factor. 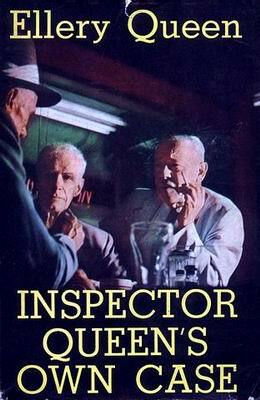 Second, the theme of persons being seen as outdated and useless to society as they age is ever present in Richard Queen's thoughts; as he considers being pushed out of his organization to make room for younger ones; and collects up his other retired buddies to operate a sub-rosa investigation. This novel shows the turning point in writing away from the Golden Age style, and into the gritty too-much-detail 1960's style. The Golden Age never discusses things like the appearance of bullet holes, or menstruation! This is what attracts me to the writing of this era. The case progresses and is somewhat predictable, with the obvious suspect being eliminated at the last minute. The steady progression of the Queen/Sherwood relationship is handled well and leads to a satisfying conclusion.